/Why Management objective is flawed? One of the pre-dominant styles of conventional management is MBO, management by objectives or results. Whenever a problem is seen, it is common practice for top management to set an objective – a target for improvement with a timeline, assign responsibility and subsequently measure the variance after end of a defined period. This approach also helps managers make conclusions about capabilities and evaluate performance of their subordinates. With an ability to pinpoint clear and measurable accountability, this approach gives a sense of control to managers – subordinates do not have room for excuses! On the face of it, the approach appears objective. However, it is not without flaws, as the following case studies highlight. A company with multiple SKUs manufactured in multiple plants implemented TOC processes in all its plants with almost a textbook case of results -output went up by 25%, on-time performance touched the high 90s. However, in one month, the OTIF dropped suddenly in few plants, the dispatches also went down. It was a big surprise. On investigation, the core problem revealed itself in a seemingly unrelated area – the logistics department! Seeing a significant increase in absolute freight expenses beyond the budget, the operations director had instructed that that the freight expenses be brought back to normal. The deterioration of on-time performance and low dispatches was linked to this seemingly “innocuous and constructive” instruction. Before implementation of TOC processes, the schedulers would put an entire order – sets of multiple SKUs packed in one container as a set – in one plant as spreading an order across plants led to seemingly “wasteful” inter-plant shipments. After implementation of TOC, the SKUs within an order were scheduled to ensure the plants were level- loaded. This ensured good utilization of capacity with improved dispatches for the company as a whole. However the inter-plant shipments went up.. When the director gave the new instruction, the schedulers took the easiest way out, and went back to placing orders in only one plant, even if it meant overloading the specific plant in some SKUs. The overloading in some lines led to reduction in overall output of the company, and frequent expediting in the overloaded plants led to drop in on-time performance. The savings for freight turned out to be a small fraction of what the company lost out in dispatches! In another company, under pressure from the board, the managing director decided to reduce working capital. He gave a mandate to reduce it by 20%. The plant managers tried to meet the numbers by controlling material releases at the month end to show a reduced WIP, which in turn impacted the output in the first week of the next month. The purchase manager tried to control flow of material from vendors, which in turn starved the plant. The 20% reduction was achieved, but the company paid the price in terms of reduced output. Many companies have their versions of similar horror stories, often discussed in informal forums. Our experience shows that this “epidemic” of short cut steps for meeting targets is more widespread than they would want to admit. If the problem is as widespread, the reason cannot be attributed to stupidity of managers, we need to analyze the method of management itself. In an organization, there are two ways to meet numbers – one is the sustainable yet a difficult path and the other is the short cut, (which can deliver immediate results but is likely to have a negative ramification on another business variable in different point of time). It is very evident that given a target, managers mostly take the short cut. Why? In any organization, the business variables are interconnected. The decision on freight can impact inventory, which in turn can impact sales, which in turn can impact collections and profits earned which in turn forces the company to reduce freight costs. 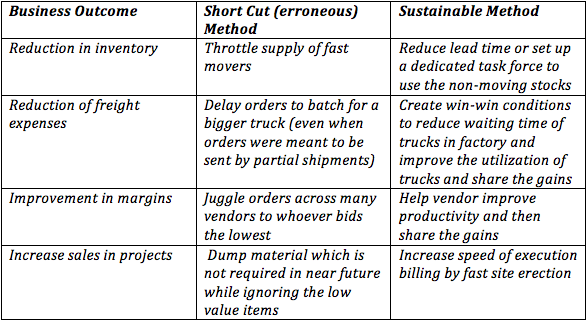 If one has to implement a sustainable improvement in a specific business variable, then he has to consider all possible ramifications in other areas. This means he has to get into areas where he does not have direct authority. For example, to improve margins, the sustainable way to get better rates from vendors would be to improve their productivity. The purchase department may need help of design and sales department to drive standardization. The easier way for the purchase department (within its locus of control) would be to divert the order from an established vendor to a new vendor willing to drop prices to gain entry. (This approach may show immediate results in margins of the order but can impact delivery reliability in the long run and may kill the overall margins due to drop in volumes). So, under the pressure of targets, it is easy to turn myopic and do what is under one’s locus of control, which invariably turns out to be the short cut method. This behavior is promoted primarily because of method of Management by Objectives, which has an implicit assumption – that given a target, every subordinate will follow the right method to meet the target. So it does not make sense for management to get into the details of how the objective will be met. The “how” part of the answer is left to the subordinates. Every manager in the hierarchy follows the same method and passes on the target to the subordinates. . At the lowest level of the hierarchy, operators have very restricted ability to impact outcomes, and hence, the short cut method is widely followed. What is the objective outcome one wants to achieve by solving the problem? What are the tactical steps required to achieve the objective? Why do we claim that the tactical steps will lead to the stated objective without causing negative ramifications on any other key business outcomes? The real change in approach is agreement on tactical steps required for implementation. Agreement on the tactical steps (after validation of assumptions behind the tactical steps) will help top management prevent the implementation of short-cut steps and allow implementation of only the sustainable steps. Once the tactical steps are identified, the focus of management should shift to speed of the implementation of steps. This requires dedicated capacity and frequent review of the steps.. The outcomes or the results are just bi-products of implementing the tactical steps.